Download Samsung Experience 10 Launcher v10.0.00.51 APK now! 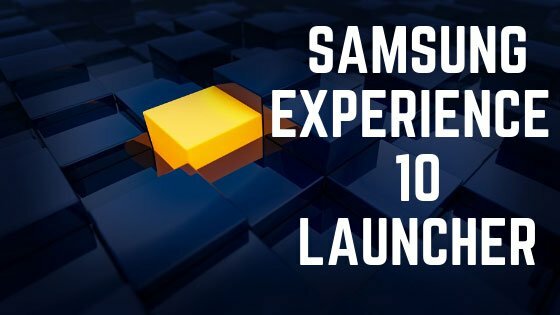 Samsung’s homemade Experience 10 launcher is available to download. You can install it on any Samsung Galaxy devices running Android 8.0 Oreo or above. This launcher has been extracted from the leaked Galaxy S9+ Android Pie update. As the OEM is ready to publish their first Pie OS, it comes with a new version of Experience Launcher. Experience 10 home brings updated icons, better support for large screen devices, and some customization options. The leaked Galaxy S9+ Pie update revealed the major UI changes of the upcoming Experience 10 custom skin, the next irritation of Samsung’s OS. While you need a Galaxy S9/S9+ device to get this build, other Galaxy users having Android Oreo or above on their phone can test the Experience 10 launcher. Previously, TouchWiz was the name of Experience Launcher. Now, Samsung improved the new build with modern looks, clean interface, with latest icon designs. Moreover, the swipe up functionality for app drawer has been introduced onto this iteration as well. However, if you like the older app drawer style, you can enable it too. Till you get the official update of Android 9.0 Pie on your device, you can try out Samsung Experience 10 on your smartphone. The compatible is quite broad. We have tested on the devices mentioned above, and it worked flawlessly. But make sure, you have updated your device to Android 8 or above. The launcher is quite similar to Samsung’s Experience 9.5 as found on the Samsung Galaxy Note 9, but it has some changes with improvement. Experience 10 launcher has a slightly larger icon in the app drawer as well as in the folder. A new animation can be seen while launching Bixby Home. Those who used Bixby home earlier also begins faster than it did in Experience 9.5 home. The setting of the app has the same black background with oversized rounded corner white card style, which is specific on Experience 10 launcher. But keep in mind that this is pulled from a leaked OS, so there may be some changes in the future stable release. Before moving ahead to download Experience 10 APK, have a look on some screenshots taken from Experience 10 launcher home. After you download, install it like normal APK allowing Unknowing Source. If you are first time installing an APK file, continue reading below for the instruction. Download the Experience 10 APK from the given link! Navigate to the APK file using any file explorer app. If you are installing an APK for the first time, you will be notified to allow Unknown Source setting. Once you enable it, you should be able to install the app. After that, you should launch the launcher by pressing the home button. Then select the “Pixel Launcher” option. That’s it! You have Experience 10 launcher app installed on your phone. If you wish to revert to your stock launcher, simply go to Setting > App and then to Default Apps. In the listing, you should see the option to choose home launcher. Select the one you like. What’re your views on Samsung Experience 10 launcher? Do you like it? Is that working on your device correctly? Which phone are you using? Do let us know by commenting below!